Average Height	: 20" - 27"
Average Weight	: 40 - 75 lbs. The Plott Hound is the only American hound without British ancestry. In 1750 Jonathan Plott and his brother left Germany bound for America. They took with them five Hanoverian Hounds. Jonathan Plott's brother died during the trip but Jonathan settled in North Carolina. It was there that he raised a family and bred his dogs. A mix of Bloodhounds and Curs reportedly comprised the original stock. For the next 200 years the dogs were bred by generations of Plott family members and were referred to as the Plott's hounds. The dogs worked at hunting bear and raccoon in the Appalachian, Blue Ridge and Great Smoky Mountains of the eastern United States. The Plott family rarely put the dogs on the market so they remained rare outside the southern United States. The dogs were recognized for the first time in 1946 by the United Kennel Club. Plotts are hardy and have superior hunting instincts. They are very effective in the search for coyotes, wolves and wildcats. The breed was carefully developed to be stronger and more persistent. They were able to make good family companions but were seldom kept as such, as most owners acquired the dogs for the hunt. In 2006 the breed was officially recognized by the AKC as the "Plott" and is now shown as a show dog, but there are many who still hunt and breed them as hunting dogs. •	Not the best breed for an inexperienced or timid dog owner. •	Need training from an early age. •	Eager to please but without training can become dominant and aggressive. •	Should not be left alone with children. Can be aggressive. •	Do fine with older children, not recommended for younger children as a pet. •	Great with other dogs/pets. Prefer to be with other dogs, not alone. •	Require at least one hour/day of exercise. •	Not suited for apartments. •	An uncommon breed, not an easy breed to come by. The Plott Hound is considered the hardiest of the coonhounds. The Plott Hound is a medium-sized, powerful, muscular dog. This is a breed that makes a great partner. 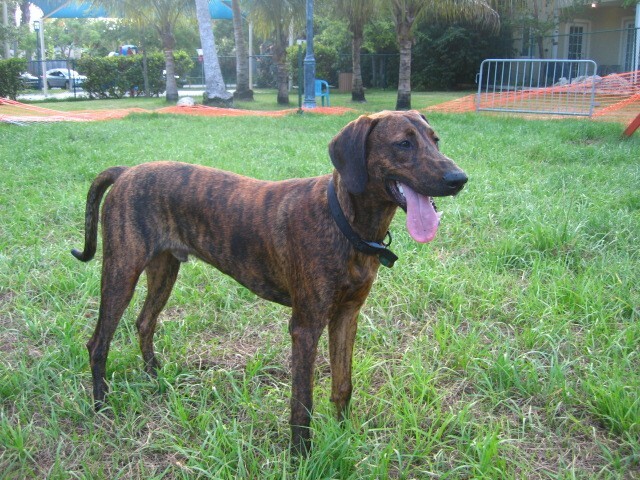 Loyal and intelligent, the Plott Hound is quick to learn, quick to love and good with children. Plotts have a personable nature ~ not evident on the trail. This large-game hunter and scenthound has great courage. Determined, courageous and proud, it will play chicken with a 500-pound bear or a wild, angry boar. The Plott has a curiously sharp and high-pitched voice, unlike the deep-throated howl common to other coonhounds. Socialize this breed at an early age and be sure to teach it simple obedience like walking on a leash. The Plott Hound needs a lot of physical exercise, which includes a daily, long, brisk walk or jog. While out on the walk the dog must be made to heel beside or behind the person holding the lead, as in a dog's mind the leader leads the way, and that leader needs to be the human. This well-muscled and rather lean-boned dog has the endurance and stamina to work all day and well into the night. The Plott Hound should have chances to run free, but is born a natural hunter and has a tendency to run off and hunt if not kept in a well-fenced area while exercising off the lead. Plotts tend to drool and slobber. They need a firm, but calm, confident, consistent handler. Proper canine to human communication is essential. The Plott Hound is not recommended for apartment life. It can live and sleep outdoors provided it has proper shelter. This breed has no road sense at all and should be kept in a safe area because it has a tendency to wander.